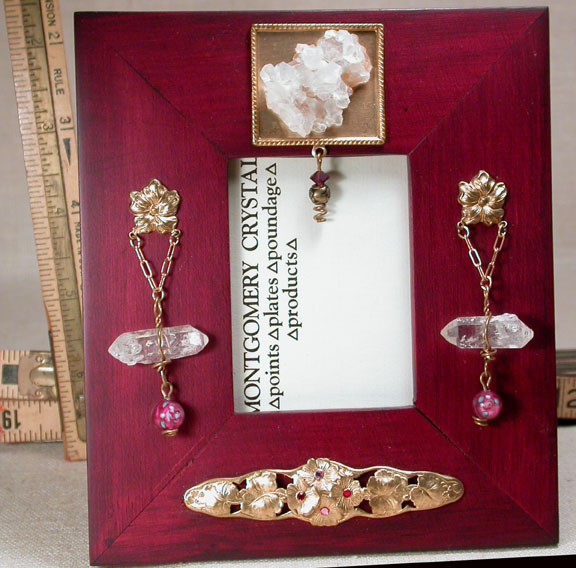 Adorned with a brass frame of its' own...and a natural Arkansas rock crystal jewelry cluster, Victorian Floral stands 5x 5-3/4" high to hold your 2x 2-1/2" memento. Doubly-terminated natural jewels paired for your delight, quartz crystals dangle from posy charms and offer rose colored handmade lampwork rose beads. Swarovski [glass] rhinestones gleam on a floral brooch bar below your chosen picture with a Swarovski facetted plum rondelle and a tiny brass rose bead. Bring your favorite photo to the table in this claret stained, beautifully hand made wooden frame - So very pretty!